It is pretty common knowledge that a big motor needs a big carb. The S&S G has been an industry standard for as long as anyone cares to remember, but like anything else, technology can always improve it. Long-time S&S users know that the G has a decent stumble and pop at low throttle as it transitions from circuit to circuit. Dan DaVinci likes the S&S and came up with a fix for the pop, then went one step further and completely modified an S&S to show some additional power. Follow along as DaVinci and Nigel Patrick show us how it is done. The ’03 Big Dog Mastiff with a 107ci S&S and a stock G carb, the stock Mastiff put out 94.1 hp and 102.6 lb-ft of torque. With the air cleaner assembly and backing plate removed, DaVinci drained the fuel in the bowl, removed the float bowl screws, and then the bowl itself. 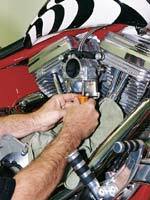 Next, the main discharge tube was pulled out of the carb body assembly, so he could install the DaVinci kit. Here is the entire DaVinci kit: a special booster anchor socket wrench, Loctite, annular discharge booster, booster anchor, discharge tube, and main jet. To install the kit, we simply placed the booster anchor into the supplied socket wrench with a little Loctite on the threads and placed the booster inside the venturi of the carb. Then, we put the anchor and socket into the main discharge tube hole and tightened it down snugly. We then, screwed the new discharge tube into the main discharge tube hole along with the included jet, just as we would with a normal S&S G carb. 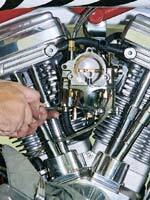 Don’t forget to put on the float bowl gasket, then screw the float bowl back into place. Using a hex key, DaVinci bolted the backing plate into the head and put the air cleaner and cover back on in preparation for our second dyno run. All DaVinci did was bolt on the DaVinci kit and the bike produced 99.6 hp and 107.8 lb-ft of torque — a 5.5hp and 5.2lb-ft of torque gain in 15 minutes! The DaVinci Fire Power Carburetor is a true performance upgrade from the original S&S G. You can see some of the differences between the S&S … …. and the DaVinci Fire Power. 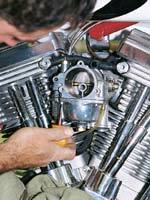 The Fire Power carb comes chrome-plated, the annular power booster is factory installed, it has a replaceable high-speed air-bleed to allow tuners to customize their fuel curve, extended hexagon bowl bolt screws to improve access and reduce time when removing the bowl while it is still on the bike, an extended idle screw knob that allows adjustments to be made by hand, and the main fuel jet can be changed using a standard jet tool without removing the bowl. The inner diameter of the venturi on the Fire Power carb has been precision machined and bored from the original 44mm to 48mm, then hand blended to final size, shape, and finish. To further increase airflow, the butterfly shaft is milled from 0.280 inches to 0.170 inches. This increases the air flow to 385 cfm — a 36cfm increase or about a 10-percent total gain over the stock S&S G. Installation of the Fire Power carb is just as easy as installing a stock S&S G. We detached the fuel line, unbolted the carb from the manifold from the primary side of the bike, and removed the throttle cable ferrules from the throttle spool. We grabbed the new Fire Power carb and inserted the ferrules into the Fire Power throttle spool. Then, we put the phenolic spacer back between the carb and manifold, and bolted the carb to the manifold. Then, we hooked the fuel line back onto the fuel inlet on the bottom of the bowl and tightened the worm screw on the hose clamp. The backing plate went on next, followed by the air cleaner and the cover. Nigel Patrick of Patrick Racing performed his final run of the day with the Fire Power carb installed. The bike still looks stock, but the numbers don’t lie. Our final numbers of the morning were 106 hp and 107.1 lb-ft of torque — the Fire Power carb produced 6.4 more hp than the DaVinci Kit and a total of 11.9 hp and 4.5 lb-ft of torque more than the stock S&S G! 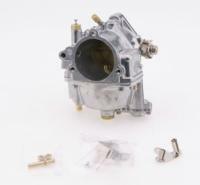 Both the S&S Carburetor and DaVinci Booster Kit can be found at J&P Cycles.